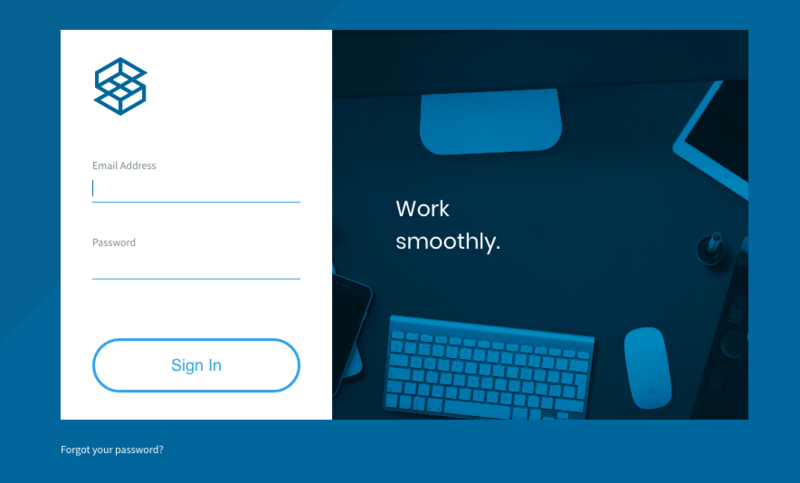 Use your desktop computer to view your upcoming schedule, update your contacts, measurements, and upload new images and video to Syngency. If your agency is using our Talent Portal then it's never been easier to check your agency chart/calendar and update your details from your desktop computer. Once your agency has enabled your login for the Talent Portal you will be sent an email with a link to the portal and your login details. 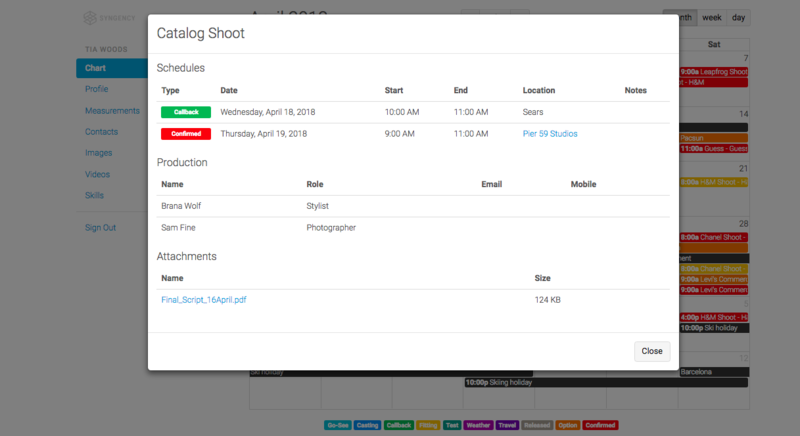 Once you have signed into the Talent Portal you will be able to view you schedule, update details and upload new images and videos for your agency to use. The menu on the left of the screen enables you to easily navigate between sections you would like to view and update. 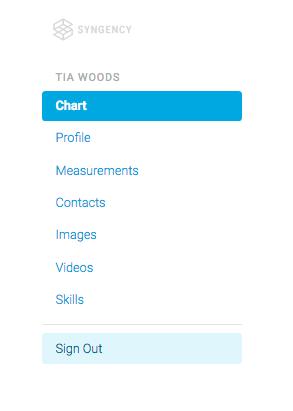 The Talent Portal opens into your agency Chart. The Chart shows you the status type of everything in your schedule. 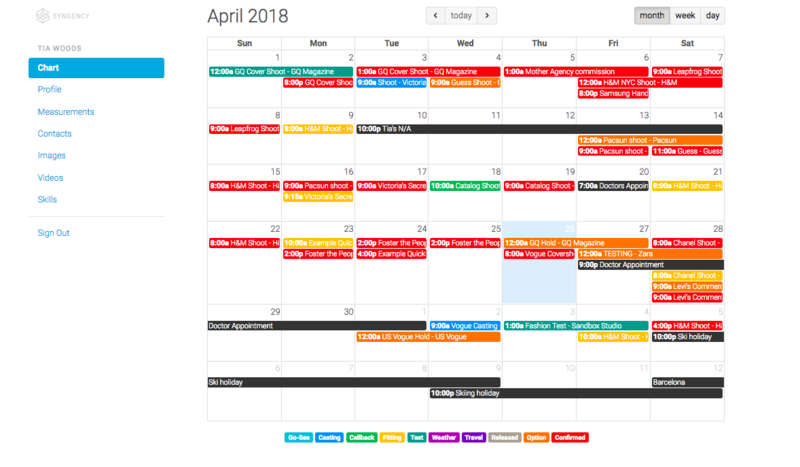 There is a key underneath the calendar to explain which schedule type each colour represents. To view the details of a schedule, click on the item and a pop up window will appear with further information. 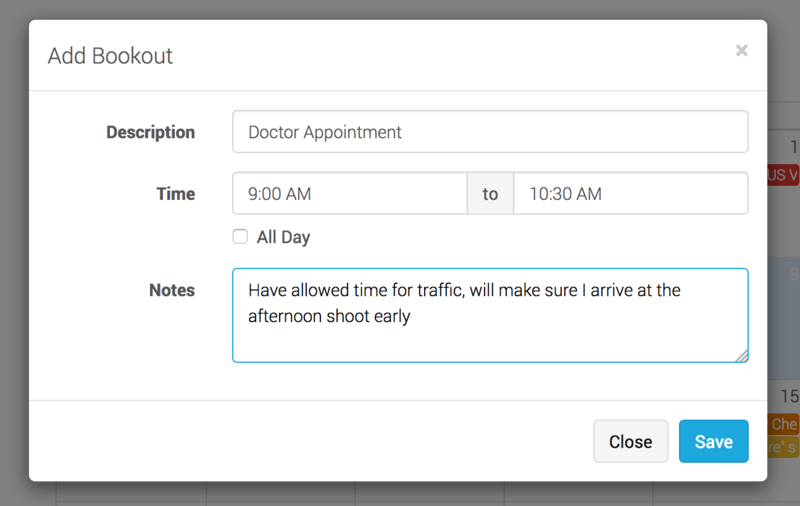 You are able to add bookouts (periods of time during which you are unavailable to be booked – such as vacation or school) to your chart, by clicking on a blank area of the chart. Click on a day to add the bookout to just that day, or click and drag across several days if needed. Once you add, update, or delete a bookout, Syngency will send a notification to your agent. 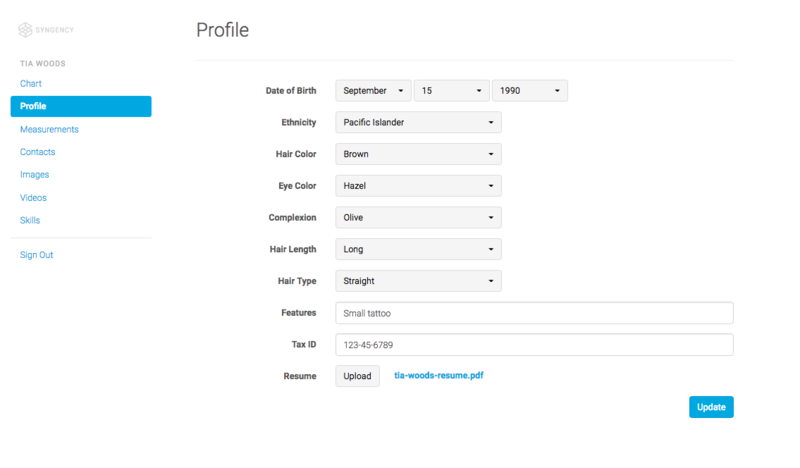 The Profile tab lets you update your general profile information, including your resume. Once you make any change you wish to save, make sure you click Update to save and update them. The Measurements tab shows you what measurements your agency currently has on file for you. 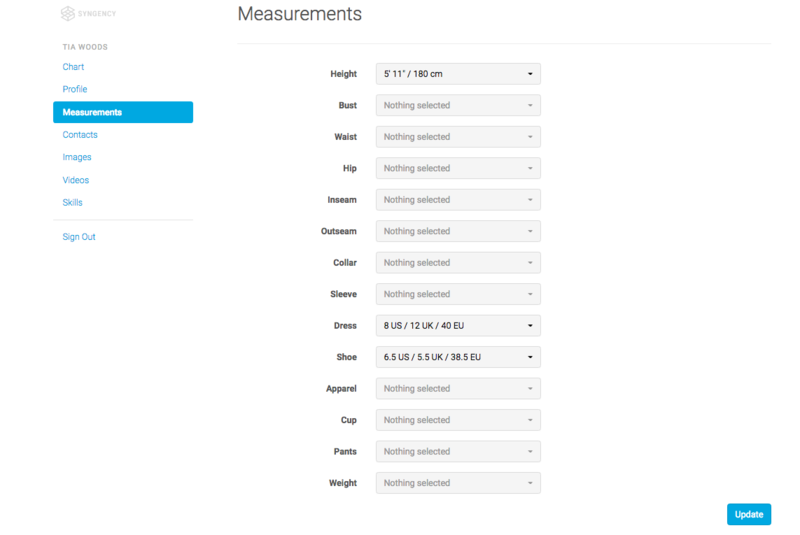 You are able to update and add your measurements here by clicking on the dropdown and selecting. Remember to click Update to save any changes made. In Contacts you can see what contact your agency has on file for you and update or add any new ones. 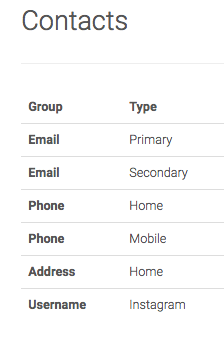 To update a contact detail, click on the group or type and a window will pop up with the information to be updated. To add a new contact, click on the Add button on the bottom right of the screen. 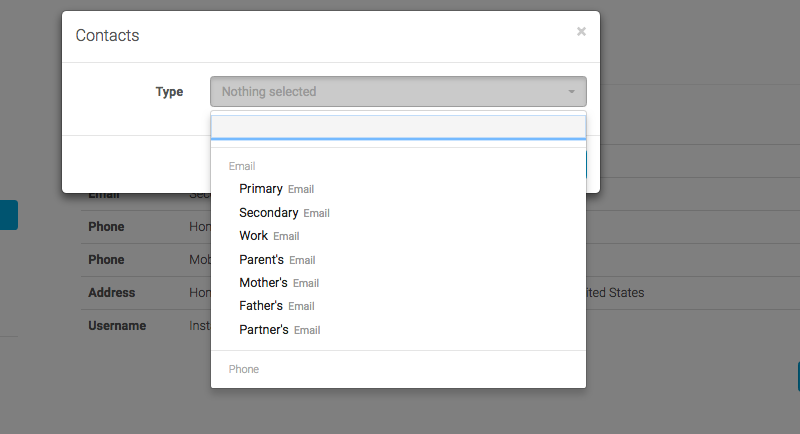 A pop up window will open for you to select the type of contact from the drop down. Once select the pop up will refresh and you will be able to add the information. Remember to hit Save when you are done. The tabs Images and Videos enable you to upload new images and videos to your agency profile. These images and videos go into an Archived gallery in your agency profile, and your agency can choose which images to publish on their website. Note: You can only view the images and videos you have uploaded – don't be alarmed if you do not see your whole portfolio here. 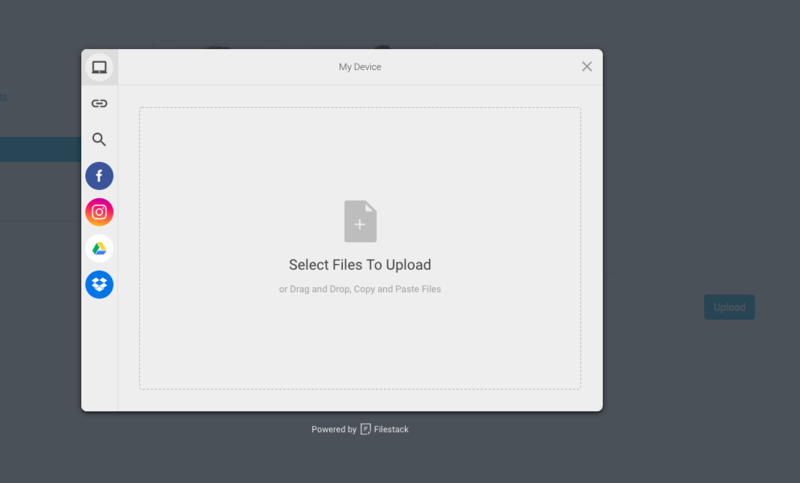 It's easy to choose and upload images and videos - click the Upload button and in the pop up window select files to upload. The final tab is the Skills section. Here you are able to update or add any new skills you may have aquired. Skills are rated 1 (average) to 3 (excellent). 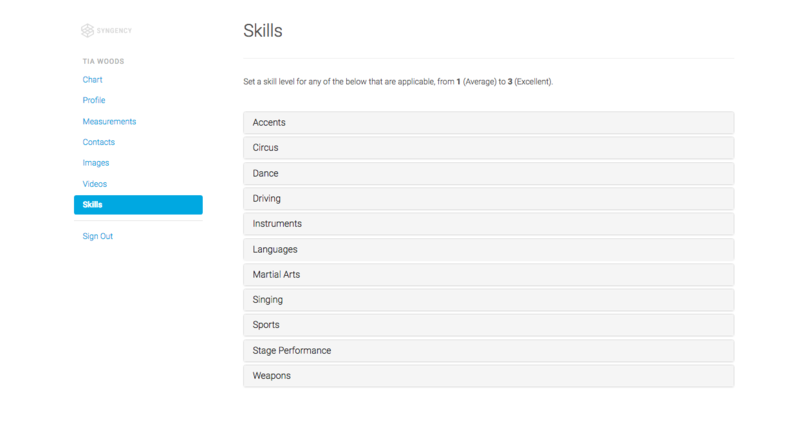 Select a category by clicking on the category bar and it will open out to show the different skills in the category. 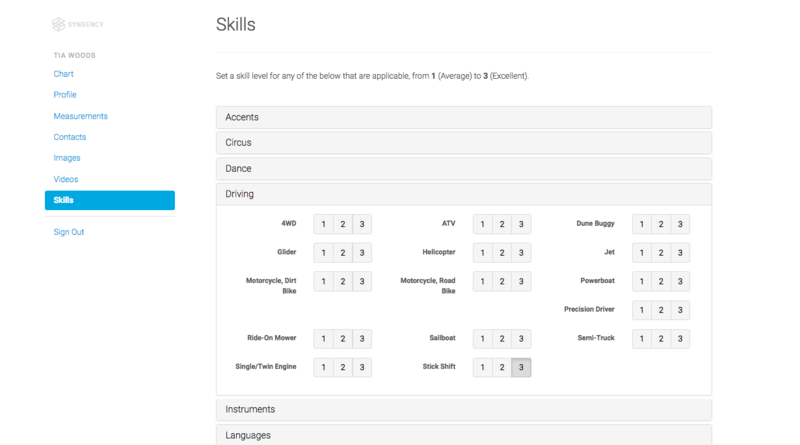 The skills will automatically be update in your agency profile. When you are finished accessing your Talent Portal remember to Sign Out.